We wrote about Behrokh Khoshnevis’ awe-inspiring, rapid-prototyping “robo builder” back in 2005 when it was still a work in progress. In the near future, the University of Southern California professor’s contour crafting machine will be put to the test to build a two-story house in less than 24 hours, using only concrete and gypsum—and without the help of a single human hand. Khoshenevis’ groundbreaking robo-builder has caused some raised eyebrows and dropped jaws within the architectural community, as the machine provides a new model for construction that drastically cuts building timelines, material, manpower, and most importantly, waste and carbon emissions. 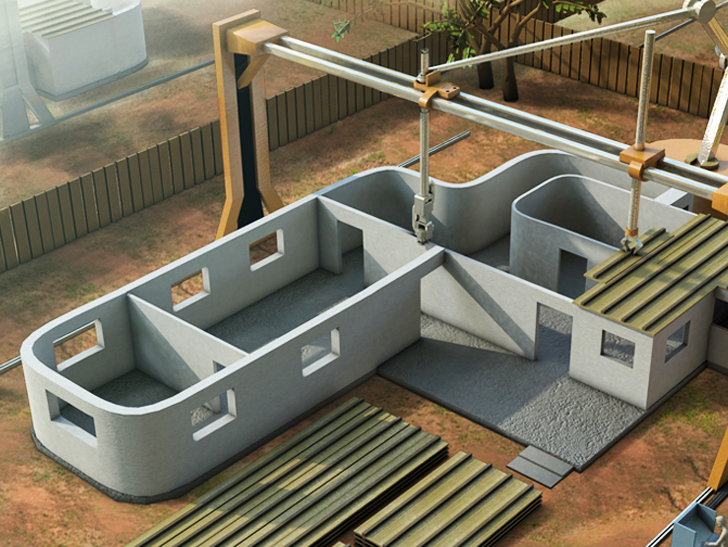 Robo-building could completely revolutionize the building industry. A typical American house takes at least six months to complete, generating roughly four tons of waste. The new robo-builder will be able to erect most structures in about a day, generating far less waste in the process. Khoshnevis believes that the contour crafter will ultimately be able to create structures using adobe, mud and straw dried by the sun rather than cement. The USC engineering professor was inspired to build this machine after an earthquake destroyed the city of Bam in his native Iran. Witnessing the devastation, Khoshnevis realized that a technology was needed to allow people to build stable homes in a rapid and economical manner. Contour Crafting is also being explored as a possible means of building habitats on other planets and moons, which are being targeted for human colonization before the end of the new century. Read more about the Khoshnevis’ contour crafting machine here or watch a video of the robot in action here. With small volumes the concrets weight will not be a problem -- but with bigger scale mashines there be huge problems ,concrete are cheap as the contains are rough not refined smooth and very controlled as with the inviroments. But my doubt acturly lay in another aspect of this -- I see this as a limited perception of the building structure. The house as just the outher limits, where the walls in fact are the least thing about it, A revolution in architecture and our perception of the build works simply must cover more than the outher wallsm it has to cover the structure as a whole, not continue like this concept, emagining the house as hundreds of parts all asking their own production line . A new architecture must dover the house as it's structure , --- please check my homepage where this is described in detail, the chinese buy this , so your time spend are not wasted. Think it could be fantastic. A little more work needed though - there was no insulation shown on the animation on their website for instance. No point saving CO2 in production to let it all leak out of the walls. hmmmmm, I think a lot of you are missing the point. I assume this will primarily aid in the quick rebuilding of temporary housing, due to disasters etc. I doubt the aim for this machine is to break into mainstream building and architecture. what about rebar...seems like it would start to crumble like wrights houses are now without rebar? I think this is a great idea, if they can make it work. However, I think it is still a little far off and this is the test phase. When the trial run is complete they will study the stresses on the house and see where the kinks need to be worked out. I'm thinking this is not only going to be used for cheap housing. People usually make robots to do things that are to dangerous for people to do. This system could not only be used on Earth, but could be sent to the moon or Mars to set up bases that would take very little time for crews to finish once they arrived. I do not think this will replace the builders of the world, but it might asist them in the future of space exploration. First, lets just wait to see this thing do what they say it can do. I'll be waiting for the Dicovery channel to keep me updated. This is inspiring to see, but like most developing ideas, much remains to be worked out before the final product is market ready. I see a number of positives and negatives to comment on, some of which have been already mentioned, some not. Positive: - Forming concrete in this way will certainly save tons of formwork material- a costly, time consuming, and environmentally wasteful practice. - Building with concrete is durable, which may begin a trend away from "disposable" architecture that is so common. - Concrete provides great thermal mass, which if used well, provides excellent passive climate benefits. - Potentially very quick way to build. - Decrease costs by labor savings. - Material and method makes complex forms easy to create. - For openings, the machine can be programmed to leave gaps in the walls, and then a steel angle lintel could be laid in place by workers as the machine returns across the top of the opening to form the wall above. Negatives: - Concrete placed by this machine is not reinforced, which excludes it from use just about anywhere the States. Non-reinforced masonry is common in Australia and non-seismic zones, so there is likely still an application internationally. - Concrete as a material has a relatively high embodied energy cost (mining, processing, transportation) - unless the buildings built of solid concrete remain for a very long time, it's eco cost is likely higher than if built with a renewable resource. - Weight of structure may not be suitable for some locations with poor bearing capacities. - Insulation required for most climates means that framing and wall linings are still necessary. - Solid walls do not accommodate concealed services; see note above. - Setting up a solid and accurate framework to support the machine on site so that it can build accurately will be difficult and will likely require large clearances beyond the building perimeter, and likely foundations of its own. Must be a pretty beefy framework to support not just the machinery, but the heavy wet material being placed, and must be able to handle the rapid changes in direction that the machine makes without distortion. - Same concerns stated by others about material in lower courses compressing from weight of courses above. - Same concerns about keeping the machine working properly during use, and the potentially huge cost of having it break when a couple dozen full concrete trucks are standing by. - Concrete is more expensive (initially) than most alternative building materials. Though this may be offset substantially by elimination of the formwork cost and labor. - Placing furniture in a curved room is difficult. Ok I'm just kidding. Well that's what comes to mind right off. Regardless, I love to see people pushing the boundaries of building technology. this brings TEARS TO MY EYES i saw this technology a couple of years ago, when i was wanting to build a [modernist] SIP house, and it's been haunting my imagination ever since. we couldn't afford to build, and i kick myself at least every week for not going into massive debt to build that dream house. i've got a lot of years left (i'm 27) to build that dream, and if this thing pans out, i might just be able to do it, WITHIN MY MEANS. where are the people who are talking about the POSSIBILITIES if this does work? i've messed around with a cnc router before, and once you see the possibilities of machines like that, it's hard to contain the imagination. Your favorite graphic designer could dream up some beautiful [3D] shapes, you could ponder those shapes with a gifted space architect, followed by a phenom space planner, and any other design professional (HUMAN TOUCH) you want, not to mention you throwing in those hidden hallways and secret rooms with schematics and such. A dream house, that's actually cheaper than any of the [cheap labor used the wrong nails in my bathroom ceiling and now they're rusting through the plaster] MAN-made 30'x40' boxes i live in. for people like me, who had to settle, but still think they're into residential architecture, and that the space you live in could greatly affect quality of life, this idea is potentially life-changing (if it works). Totally agree. As an architecture student in the UK you tear your hair out at the state of architecture in this country (and arguably the USA). A great number of talented architects, with a overly cautious public/government that won't let them create buildings that are genuinely of their time. But I guess you can't expect too many people to spend so much money on something experimental... Good point about cars too - if you've got 20k pounds (40k dollars) to spend on a car, they'll keep stuffing in more features until there's 20k's worth instead of offering you what you need for 10k! I do agree Nick that technological advancements should be allowed to flourish. I would be the first to welcome any improvements in the building industry that would allow for a less expensive home to be built and have the savings passed on to consumers. Realistically though, technological improvements don't always translate to consumer svaings. The average car is a perfect example. They haven't gotten cheaper, but have become much safer and somewhat more efficient. I'm amazed at the improvements in building effeciency and sustainabilty that where proposed by the likes of Mies, Frank Lloyd Wright and Bucky Fuller that never truly saw their way into the average residential archetype that we see littered across the suburbs. To this day many of those ideas still seem outlandish to the average home buyer. Unfortunately the construction industry is a very slow moving machine, especially the residential sector. Change comes very, very slowly and ultimately only when the consumers demand it. I look forward to a more systemized form of building and would hope that technology brings us closer to the process of building rather than farther away. That doesn't neccesarily mean ignoring the positves of mechanized labor but more the involvement of a deeper sense of craft in the building as a whole. I see many skilled laborers each day that are only going through the motions of building without much care or interest in the final building itself, even though the building will stand long after we are all gone. That seems important to me in that a culture is often judged historically, by their architecture. Ron asked how many of us are in the construction industry? I am, I'm a builder. Conceptually I believe that any experimentation into bringing greater efficiencies into the building industry is a positive. There is a great deal of redundency and waste in the average building project. The real world application for this robo-builder seems limited, but with further exploration a more practical version will be sure to surface. Basic building components like exterior windows and doors would need a steel lintel of some sort prior to cutting a hole in the final structure to accomodate those buidling elements. This is just one of the many different assembly components that would have to take this idea from a machine that pores continuous walls to an actual fabricator of building assemblies. I agree that prefab panels, shipped to site, seems to be a much more realistic way to build efficiently and quickly. Especially when considering the many building componets required to make up a usable living environment. Weather alone would be a factor in the workings of this machine on site. I also agree with the statement that builders and developers in general would be quick to embrace any new technology that helped their bottom line, but only in cicumstances that proved the final purchaser actually wanted it. There's a reason why the typical house design has not changed in over a hundred years. Consumers associate a certain aesthic to the average home. It's nostalgic and inefficient but it's a reality. Developers will only build houses they can pretty much guarantee will be sold. The general populace has yet to embrace a modern aesthetic that has been in existance for almost a century. Real chnage will come when a 3000 unit subdivision is built in a manner indicicative of our times, technolgy and advancemnts. Car design progresses endlessly but the average North American house stays the same, aside from some minor advances such as engineered wood and steel studs used in everday applications, but it's still basically stick framing. Ultimately I feel that a truly sustainable architectural movement will be about involving human beings as opposed to removing them from the process. The construction industry is one of North America's largest employers. Skilled workers are indeed hard to find, but the removal of all trades from building takes away a relationship between man and the construction of shelter, that has exsitied since the beginning of civilazation. What is the final point of technological advancements, is it to give us nothing to do? Will we just end up sitting in a corner while technology creates around us. Sorry for the long reply. Just sayin'. Joe - it creates flat walls, how on earth is that ugly, cold or featureless compared to the flat walls of existing houses?! And on top of that, as you can see from the video (did you watch it?) it can create curving walls, sloping walls, domes etc... I'm pretty certain it could easily create a huge range of organic shapes and volumes, unlike the majority of bricklayers and builders. I don't mean to be rude, but I've got no idea where your comment comes from..? Interesting idea, but...this prototype is not even to the "proof of concept" stage - it simply demonstrates that a CNC Machine can be built to pour concrete. Aside from huge development, logistical, and financial challenges people are not going to want houses built this way because they are ugly, cold and featureless. I'd say: don't waste your time and energies and create something else. Yup, totally agree - the construction industry will grab this idea with both hands. As for the strength of the building, my only concern is how the concrete can set fast enough - for full strength concrete can take weeks, so before you can go up even a metre or so the concrete at the bottom has to set. I too have questions, but these guys have been working on this for years so I can only imagine they've come up with the solutions to most of the problems. As for the argument of not separating ourselves from the process of building, I'm afraid I'd have to disagree. Increasing efficiency within a certain task is what makes us progress. For years I've agreed with the agruments that it appears perverse that all of our possessions are made to the highest and most precise engineered standards, except for the buildings in which we spend the majority of our lives. As is now being shown by the advances in prefabrication, with an increase in machining building elements we see a huge increase in material efficiency, quality, choice and environmental performance. On top of that, in many countries, such as here in the UK, well trained construction workers are increasingly rare, driving up costs and dragging down quality. This technology makes perfect sense. Automation is not always a good thing. Fine for a house,,,not a home.... I want human hands, please. Quick and easy does not equal sustainable. an entire house out of concrete is a LOT of concrete. a number of -heavy- trucks on site. a -heavy- machine that needs to remain -very- stable throughout the printing, which means complex sensing with several static points, and ground damage where it rests. one assumes that the robot will need movement about all sides of the structure, requiring the removal of existing plants/trees for some radius, and severe root damage to any trees under it's supports. if the machine is going to support tons of concrete, it's going to be a lot of steel. a lot of steel is a lot of weight to transport, and the beams necessary to span a house supporting a boatload of concrete are oversize, not the sort of thing that's cheap to transport. brilliant idea, but i'm not seeing it as the boon claimed until i see more info about how those issues will be addressed. Ok I have to wonder how many of you who have commented are in the construction industry. This is the near (less than 10 yrs) future. While a greater percentage of the houses created here are wood with concrete/brick siding in other parts of the world houses are created using concrete or some clay mixture, because cost, climate and culture make it practical. So you have to look at a world scale product rather than one geared for US/European use, I mean the inventor got his idea when the earthquake flatened part of Iran, he is only holding the demo in the US cause he is here. Also the point made about no windows and doors is null cause even now they frame a window or door with wood beams and sheet the whole building with plywood, then cut the openings out in the frame. In this case, once the walls are complete the concrete can be cut where necessary and then framed for a window or door. More practical would be the programming will tell the machine where not to pour in order to form the opening for a door or window. One of the key thing with looking at the practicality of a machine like this is that you have to visualize things in layers or like a production line, this machine coupled with one modified to lay bricks can lay a layer of cement followed by a layer of brick and so forth till the structure is built. To finish up, there was an earlier comment about the cost of workers vs this machine, anyone in this industry knows that bottom line is the profit, machines do not require medical benefits, vacations, holidays, bonuses or company perks, no more workman comp for people injured in the field, unions to delay the project, etc. Face it the cost of purchasing an machine and maintaining it is in the long run a whole lot cheaper that employing the necessary human labur to complete the same job. Concrete is cement with rocks in it. Cement is what seems to be used by this machine. Concrete with iron bar (rebar) reinforcing is much stronger than cement, or concrete, by themselves. So the pure cement approach, apparently used by Robo-Builder, seems to have pitfalls as to strength. Possibly having additives mixed in, like various fibers, plastics, fiberglass strands, or glass might help ? The real concern is cold seams inbetween layers of the mixtures appilcation, and the bottom collapsing under the full weight of the upper portion of the walls before everything has hardened enough. I guess that's why wooden 'forms' are routinely used when rebar reinforced concrete is poured. What about the Frank Lloyd Wright 'Usonian Homes' Concrete Block that he came up with ? They were concrete blocks that had an inside 'lip' which allowed concrete blocks to unerringly fit atop each other... kind of like 'Lego's' ! A concrete block system like that would make it very easy to put up concrete block walls, reinforced with rebar ? Yes, this would still use labor... but the 'Usionian Homes' were intended to be largely owner built. An owner built home 'system' using special 'stacking' concrete blocks, and limited use of expert craftsmen, or women, for finishing, electric, plumbing and other 'detail' work, seems a better way to go than the Robo-Builder. This is inspired.... I am very impressed... however, will this method allow for steel reinforment of the concrete? I am in Florida... And this would not fly without extra structure. where is the house samp;le produced, how do you produce Roof etc. Is this an expensive way of BRICK layering equipment? But you need tons of cement? it doesn't look like it could work in the real world, but in it got every single person who read this to think about the applications and problems involved. So if you really think about it, this machine has already worked in the real world. The machine in the video is a working scale model, using some kind of clay or plaster for purposes of illustration. What we have here is basically a computer-controlled slip-forming machine. The problem of lack of reinforcement remains to be solved, but even so, this could have other uses until then. Another issue is to develop a concrete mix design that will stand up under those working conditions: even zero-slump paving mix may spread at right angles to the placement and deform in the lower lifts as the upper lifts are placed. Also, the working parts of the machine have to be designed to clean themselves as they operate, in order to prevent buildup of mortar or cement paste on the interior fixed surfaces, which would impair operation and introduce inaccuracy into the results. In other words, good concept, promising technology, but I wouldn't expect to see a full-sized version of this building houses this year. In a strictly practical sense, a set of standardized forms that could be trucked to a site, bolted together, filled with concrete via conventional pump placement, and then moved in a week after the concrete sets, would probably be more economical and nearly as versatile for most applications. In fact this was tried in the 1950s in a system developed (if I'm not mistaken) by Westinghouse LeTourneau. It may have caught on briefly with mass-scale developers, but I don't hear much about it today. Another option would be a fabricating system that assembles the rebar and wire framework for ferrocement construction, seeing as the actual application of ferrocement can already be automated. This would also provide for more efficient use of concrete and a high degree of hurricane and earthquake resistance. This is a terrific idea. Perhaps the 24 hour build time does not include windows and doors, but this is all preliminary. A machine like this in conjunction with personnel to install aforementioned window and door openings/frames could still whack out a house in record time. With the "frame" in place, the other accoutrements could be put in place rather easily on the inside. Though, I agree regarding the steel frame. What's to keep this all sound and straight? Concrete without a frame seems like a stretch as far as longevity is concerned. Even ICF blocks use it to some degree. This is simply another tool to use along the way, not the end-all be-all of construction. I wouldn't worry about it replacing standard construction any time soon, for better or worse. Per Sam's comment...exactly. What about all the systems required to run the house??? And not to be pessimistic, but I doubt a multi-billion dollar industry that employs thousands of people is going to adopt this. Still interesting either way though. As with most 'revolutions', something positive always seems to result, big or small. Hmmm... Hard to picture how a machine even in real size would be able to create a house in 24 hours... windows, doors, pluming, electric, and all the working components most likely not included. Also no steel frame? The video clip of the mashine's opperation doesn't explain to me how this can be applied to building a house in 24 hours. Is this a super miniature version of the real thing? Am i just being an idiot? Behrokh Khoshnevis' Robo Builder can construct a house, including its interior components, in about 24 hours. We wrote about Behrokh Khoshnevis' awe-inspiring, rapid-prototyping "robo builder" back in 2005 when it was still a work in progress. In the near future, the University of Southern California professor's contour crafting machine will be put to the test to build a two-story house in less than 24 hours, using only concrete and gypsum—and without the help of a single human hand. Khoshenevis' groundbreaking robo-builder has caused some raised eyebrows and dropped jaws within the architectural community, as the machine provides a new model for construction that drastically cuts building timelines, material, manpower, and most importantly, waste and carbon emissions.